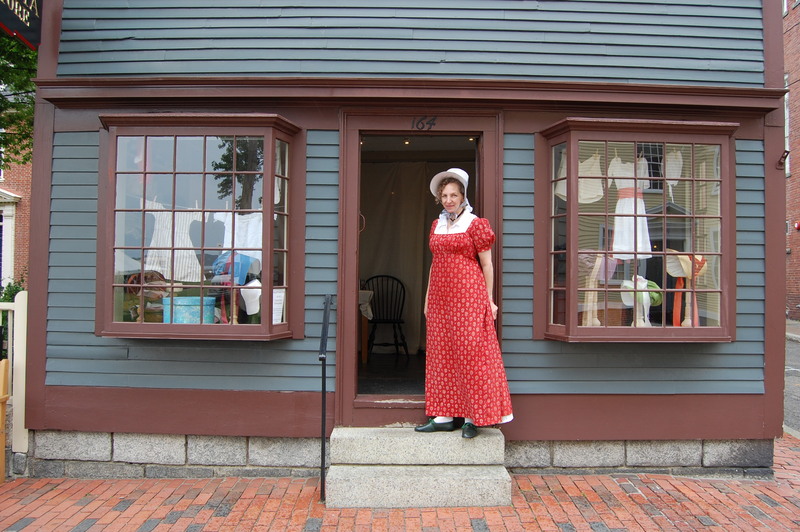 On Saturday last, Sew 18th Century and I set up a milliners’ shop for the Salem Maritime Festival. This was a fun event made even better by the opportunity to set up shop in an actual shop! We started working on this project in the Spring, and kept working on it almost until it was time to pack for the trip. 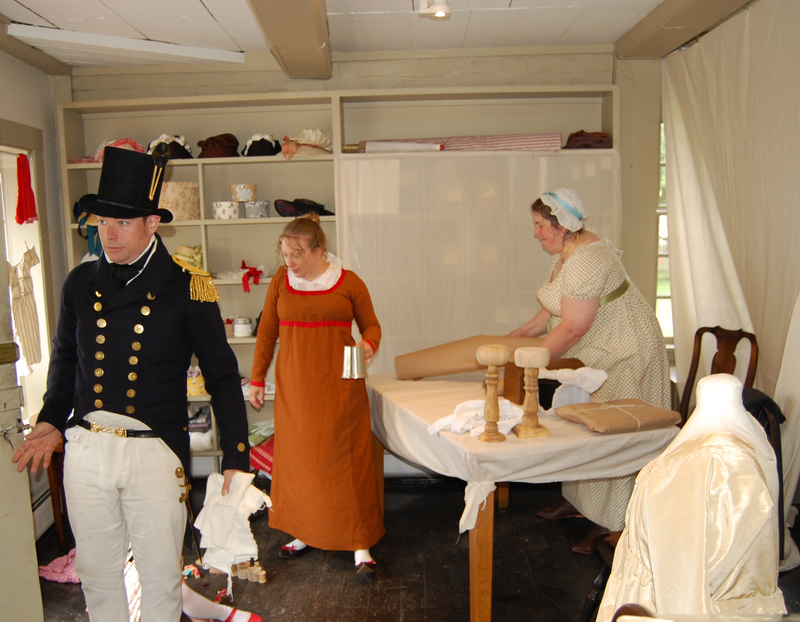 Milliners carried a wide range of goods designed to entice customers into the shop where they might purchase a new trim, ribbon or sash while admiring newer bonnet styles or fresh yard goods. 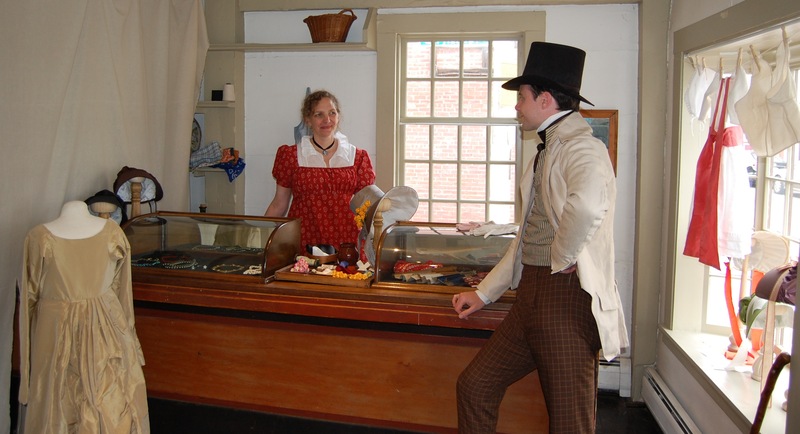 Even in the 18th and 19th century, retailers new the value of repeat customers and impulse purchasing. Customers of all kinds came to our shop, some for retail trade, and some for wholesale. Mr JS is a weaver, and has offered plain and check linens by subscription– and I think our shop can do well referring custom to him. He was far more genteel than the sailors who came in– three times they visited, offering us money, but not for our bonnets! Fresh from a privateer, Mr G and his crew mate stomped up the steps and made several untoward propositions, even daring to shake a bag of coin! Later they tried to entice a studious apprentice to join them, but fortunately he is a dutiful and serious lad with a thought for his future, and he declined their offer. At last Mr S was forced to confront these sailors on the waterfront– I think we shall soon require a committee of safety to patrol our streets and regulate the ruffians. Other customers shopped for trims and accessories. Mrs B is always fashionable, and one of our best customers. She sets a standard for refinement and style in our town that few can match. Her husband is an officer in the Navy, and I fear sometimes he is startled by the bills– though he always pays, I think he may be surprised to see how fashionable we have become in Salem. 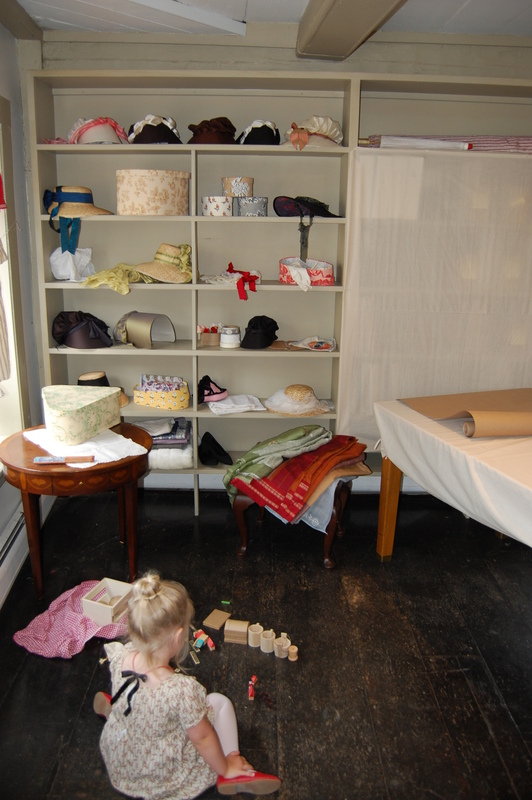 The bandbox maker, Ms M, set up in our shop as well. I do highly recommend her boxes as the finest made and best decorated that can be had. Bonnets and hats do not come cheap, and you do well to protect them. In the late morning, I paid a call to Mrs B, and took tea. The coffee jelly was exquisite, molded in the shape of fish– very clever indeed– with marzipan fish and a rice pudding. It was a delight to all the senses, though sadly I had to hurry back to the shop. It is a great responsibility to keep a shop. Thank you so much for visiting and for trading with us! Do come back soon, as we are certain to have new goods of interest to delight you. What a beautiful shop to work in. I am envious of the ample shelving and lovely display case. You dressed it so very well. Thank you! 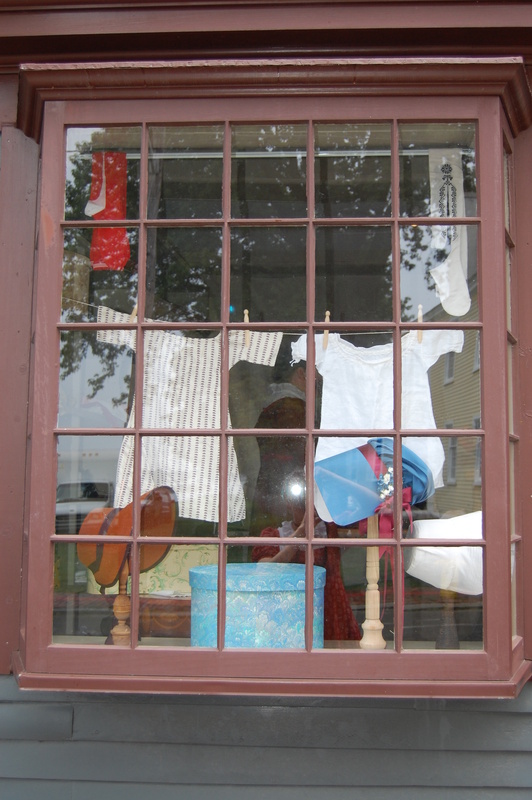 We were very lucky that Salem National Historic Site had a shop that is no longer a shop. The “store fixtures” made this much easier, and more fun! Looks amazing! I wish I could have come to see you in the shop. Thank you, Cassidy– it was a lot of fun! I wish you could have been there, too! After all, we were wearing your chemisettes and I had the cap you made me on display.